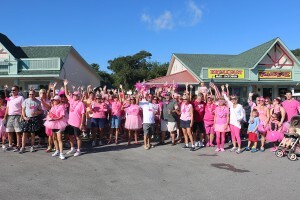 EIPHC – Divas Run For the Roses October 4, 2014 – Click image to see more pics! This Event was a great success! Thank you to all those who came out to support us and have some fun too! Check out the Diva Pics on the EIPHC Flickr site. Now ya’ll know we all can’t run so we will allow running, walking, crawling, whatever it takes for you to complete ONLY ONE MILE! That’s right…one mile! This will be a “glam” run/walk with Tiaras, Boas, Tutus or whatever bling you come up with to get attention. We start at Flipperz at 10AM, will have a water station and cheerleaders halfway (hopefully at the E Club) and finish back at Flipperz for a big celebration! All contestants finishing the race will receive a rose and a glass of bubbly(champagne). There will also be medals for various categories! The registration fee is only $5.